For a temporary trip through freezing temperatures, Mike, I would suggest simply evacuating the holding tanks and leaving them clean and dry till you can purchase tank heaters or drive out of the cold. Overnight in the campground, simply position a droplight with a 60-watt or 100-watt bulb in the area of the holding tanks. Add a gallon of windshield washer fluid to each tank as well. 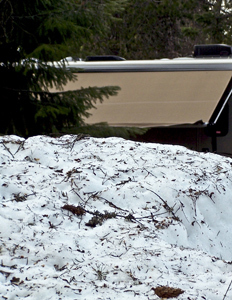 You could use standard RV anti-freeze, but the windshield stuff is a lot less expensive. The fluid and that little bit of heat will allow you to use the tanks overnight and avoid potential freezing. Come morning, empty, flush and clean again until you get to a location above the freezing mark. Travel empty, use the windshield washer fluid and the drop lamp at night. 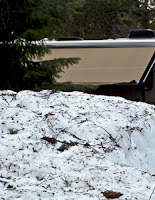 If your holding tanks are exposed under the floor of the RV, radiant heat from the highway might also be enough to keep the contents from freezing, so you might be able to go a few days with just the windshield washer fluid. Tank heaters, however, are still a wise investment if you hang around the cold country often enough!